Twelve years ago today she had sat, half on, half off the settee while he spoke to her of love, heartache, and one great loss that had hidden details; nuances he had felt compelled to share with her. Relishing his voice while simultaneously contemplating the sheer improbability that this handsome, forthright man was opening up to her for any reason other than the fact that he was lonely and perhaps starving for a conversation that did not involve condolences and pity, she had found herself faced with a dilemma: whether to answer his question with a trite and complacent “I’m fine, busy, but fine,” or to reward his openness with her own. She had chosen the latter, immediately releasing a torrent of pent up emotions and angst over her mother, whose worsening dementia, sudden weight loss and growing despair had kept her teetering precariously on the edge just shy of insanity. Instead of recoiling at her insensitive sharing; after all, his far more pressing needs should have kept her silent, he had listened intently, his eyes penetrating her soul, so that speaking anything other than truth had become impossible, and it was only then, when she had exhausted her thoughts, that he had offered her his unfettered, unfiltered opinion. This, she realized while packing for their annual unofficial-anniversary sojourn, is when they had begun making memories together; their souls becoming inseparable after one conversation, after which nothing else had existed but the amazing love that would take them, unexpectedly, beautifully, by storm into the wildest and best ride of their lives. Oh wow, I love this! An unexpected beginning to love…and those memories we make together. You’re able to reach right inside and bring out those treasured, but often unusual or unexpected, moments of peoples’ lives Britton. I always look forward to your writing showing up on my Blog list! Lisa, your visits always lift me up and put a smile on my face. I made a few edits since you read this post…so perhaps it is better now. I’m about to hop on the trail of visiting others, including yours…right after I post a pic for this – which I forgot. Give it 5 minutes and you’ll see the pic as well. Again, thank you, Lisa! It’s a beautiful piece in its entirety! The sentences flowed showing their anxiety and hesitation, but ultimately creating an intense love. Great photo too. This is beautiful, Britton. It reads like exquisite Irish lace delicately sewn together. Nice work, my friend. Jayne, your comment also feels like Irish lace, and I am smiling with gratitude for it. My goodness – what a ride! I can’t wait to see the next installment! Thank you Andrew. It’s nice to have you visit, and I thoroughly enjoyed your FSF piece. 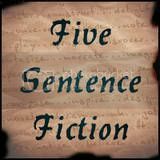 I love these Five Sentence stories. You never cease to inspire me with the magic of your words. Well done, my friend! What a lovely compliment – thank you Becky! Beautifully woven, unexpected, beautifully written. Thank you! Thank you Rossandra. Missing you! Let’s get together as soon as practical! Hollywood tells us love happens when lovers drop their clothes. As you point out so well, it really happens when lovers drop their guard, the armor and misleading deflections that society demands. A tender thought for the day! “the armor and misleading deflections that society demands,” –so well said. It’s difficult to be real, but so worth it. Such an astute point, Deborah!! It’s fantastic how you packed these sentences so full of emotion and detail. I just love this!!! Thank you Lillie – and all because of you! !